One of those green poker visors. Yes, those are three ways to protect your eyes from the sun. They’re just not very good ones. So instead, fix your gaze upon Supperclub Eyewear, a new outpost of attractive sunglasses that can be mailed from the Internet directly to your face, online now. Sure, the sun is helpful for trifling things like photosynthesis and being alive. But it can be a real nuisance when you’re driving a car or catching a pop-up or trying to read a brunch menu on a bright patio. 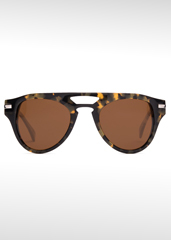 So fortunately, a design-oriented duo made you some sunglasses to assist with such endeavors. Right now, they’ve got four limited-run frame designs, each one handmade and available in colors like “caviar black” and “whiskey.” Go with something oversize and round for that where’s-the-nearest-yacht look. Or try something sleeker and more squared off for that oh-I-found-it look. Either way, you’ll be blocking UV rays while being all dashing about it. But let’s say you’re less interested in sunglasses and more interested in made-to-order leather jackets and vintage hip flasks. They’ve got a couple of those things, too. Because sunglasses don’t hold gin.